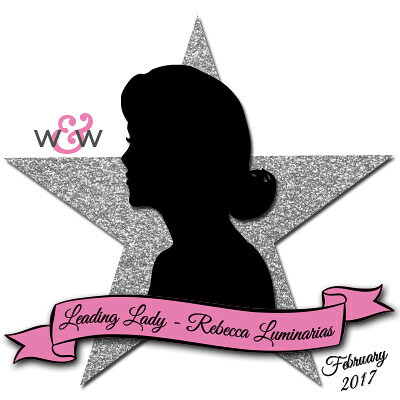 Our February Leading Lady, Rebecca Luminarias, is back for her triumphant third performance! If you missed her smashing debut you must see it...CLICK HERE or her stunningly sensational second performance CLICK HERE. 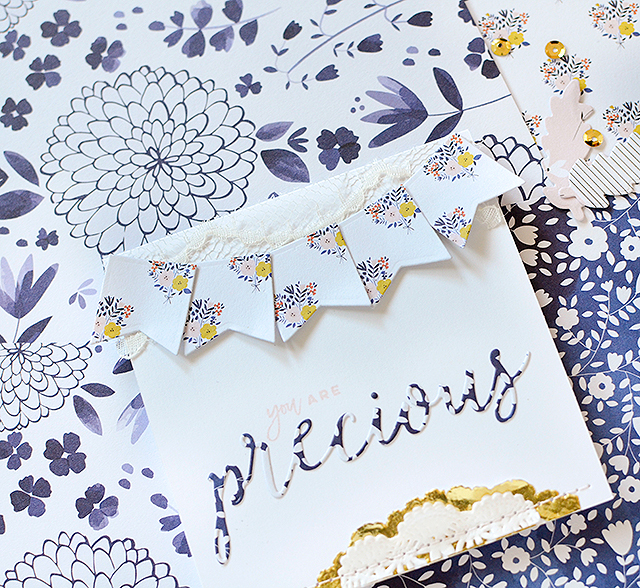 Today she shows how a little planning can produce quick, easy and beautiful results! Hi, friends! I have to say that Winnie & Walter maybe have the best fan following in the paper crafting business. You guys are awesome! Thank you again for all the love and kind words you have left for me. I love being able to create but when I hear that I've inspired you or that you get where I'm coming from, that, in turn, inspires me. Your comments are truly appreciated and taken to heart. I actually had a different project in mind for this week than the one I'm sharing here today, but life got a little out of control last week and, as my deadline for submitting this post was approaching, I realized there was no way I'd be able to complete it on time AND be thorough in my photos and written content. The good news is, you'll still get to see it as my finale next week! So without my planned project, I was facing a nerve-wracking dilemma. What can I come up with in 24 hours to share this week?! 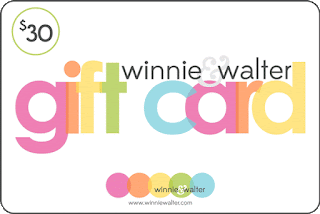 Remember, I'm not a super-fantastic-amazing-mindblowing stamper...but I do really love to make cards and I do have other awesome Winnie & Walter products at my fingertips--like Cutaways! And after a somewhat panicky brainstorming session, I had a few ideas for some quick and simple cards. The first one I made was the simplest, and it inspired the two that followed. I have acquired a W&W product collection that would make most people drool and I set out to use as many different sets as I could, while still keeping the feel of each canvas clean and easy. 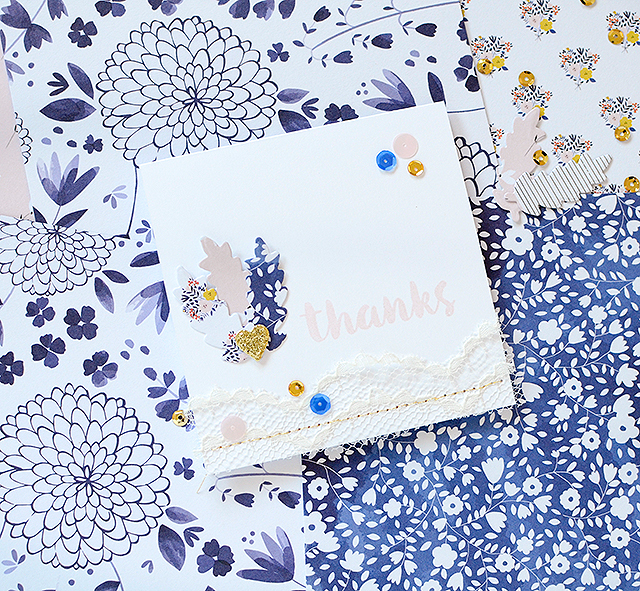 A thank you card is always useful, I thought, eyeing the bold brushed style of the From the Bottom of My Heart stamp set (January/February 2017 Release free with qualifying $25.00 purchase until Friday, February 17, 2017 at 11:59 p.m. CST and will be released for purchase later this year). So I started by die cutting some leaf stems with the Framed with Evelin T Designs Cutaways in different papers. 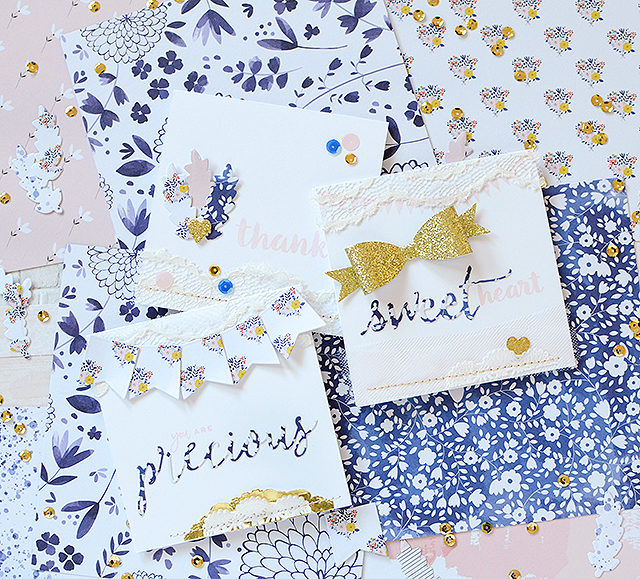 All the papers seen here are from Pinkfresh Studio's gorgeous Indigo Hills line. I carefully stamped "thanks" on the card, emitting a huge sigh of relief when I lifted the stamp and found a complete image, sans smears and weird discoloration. Then I stitched on a strip of lace with some gold thread, adhered the leaf cuts, and added a few sequins. See? Quick, easy, simple...after all of the mind-changing and anxious hemming and hawing over the actual design of the card! But surely we've all been there, right?! My second card was a a bit less agonizing as I was using a much smaller stamp this time and it isn't one of the main focal points. I wanted to be sure I got to use the In a Word: Precious Script die at least once during my LL tenure because it's gorgeous. 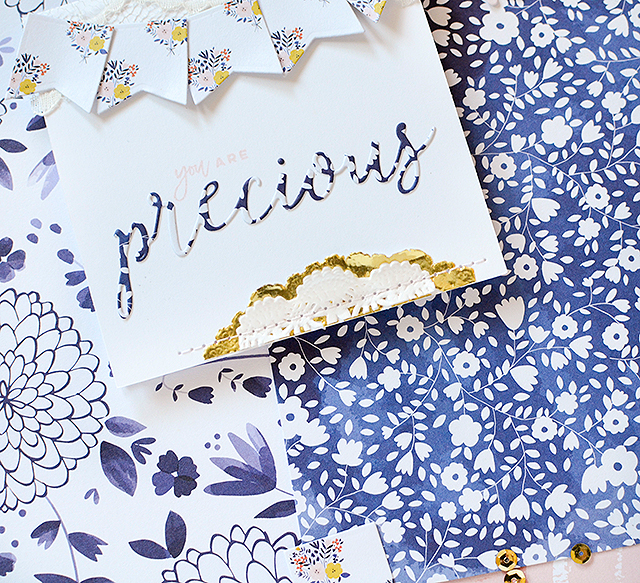 I had the idea to cut the word out of floral paper and pair it with the phrase "You are." "You are my" is one of the sentiments from the Sentimental: Endearments set so I masked off the my. It worked, yay! I decided to take the small flag die from the Essentials: Lana Cutaways and create a little bunting (who can resist buntings?!) to accompany my statement. A little bit of lace underneath, because precious and lace go together like milk and cookies. When I adhered the flags for the bunting, I didn't glue down the entire piece, leaving the bottoms raised and even curling them up a bit with my fingers for some extra dimension. Just for a little interest, I stitched a few doily scraps along the bottom edge of the card. It adds another kind of texture without making the card too busy. I had a different idea for my last card, but when that wasn't really working so well, I scrapped the original idea and decided to use a few less elements, which actually made me like the card a lot better when it was all done. I was going to do another bunting-type card, but with a different die. 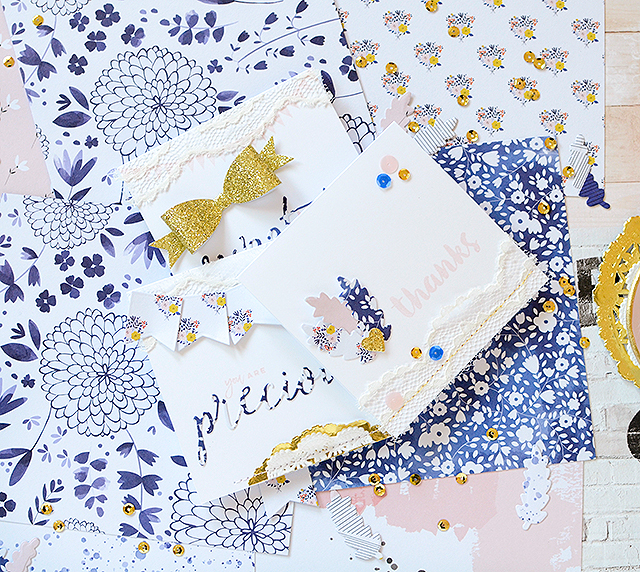 In my mind I pictured a drapey sort of look with scalloped lace, a banner-type stamp, and this other bunting, however, the scale of the card was much too small to achieve this and it ended up just looking way too chaotic. 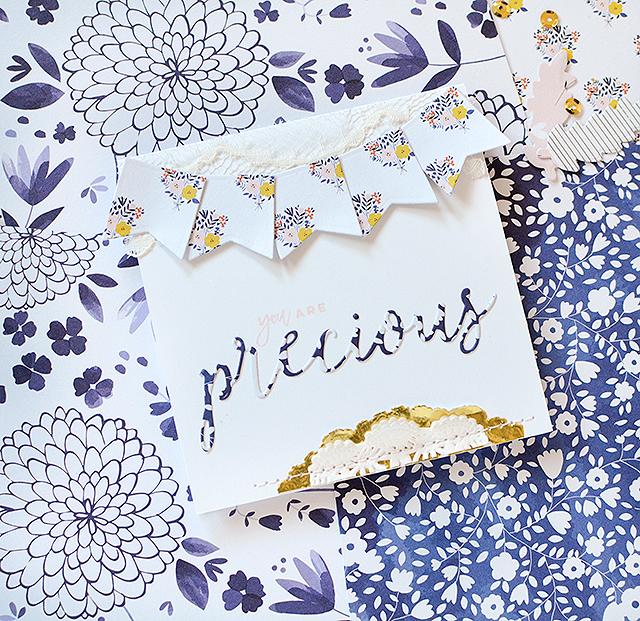 I got rid of the DIY bunting and just went with the lace and the stamp, which is from the New Release set of Scenery: Stripes 2 and I curved it when I placed it on the acrylic block to make it look like a party banner. I like the simplified look much better. While my original bunting idea was unsuccessful, I still felt as though this card needed a little something more so I tested out a glitter bow (another item I cut and assemble in bulk) and it was perfect! 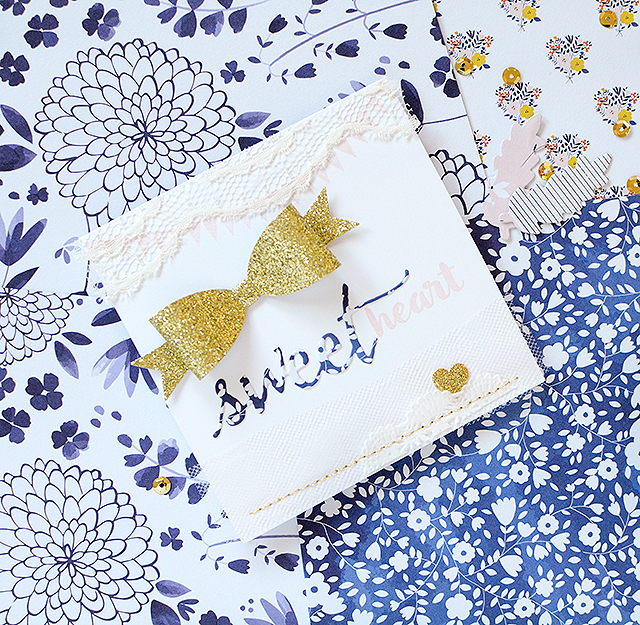 It's such a cute card for a baby or little girl, don't you think? Well, hopefully the cards don't look too thrown together in haste (because, remember, the concepts took me quite awhile :). I'm actually pretty pleased with them and feel they are definitely MY signature style. I'm really looking forward to sharing my LL finale with you next week, though. I hope it's fun for everyone! 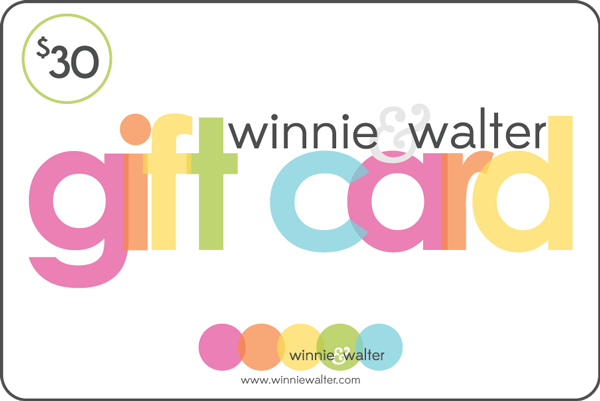 Until then, I've got the Winnie & Walter Giveaway going on my blog this week and next! I know you don't want to miss your chance at a $30 gift certificate to the shop so pop around over there for all the details! Then I'll see you right back here next week! oh my, such GORGEOUS projects! How very pretty! What a fabulous colour combination and one I've never thought of before. Great cards! Your style is unmistakable--so unique, modern & beautiful! I'm totally in awe once again & CAS is certainly not simple! If only I could come up with something like this in an hour--would take me all day to figure out these designs! 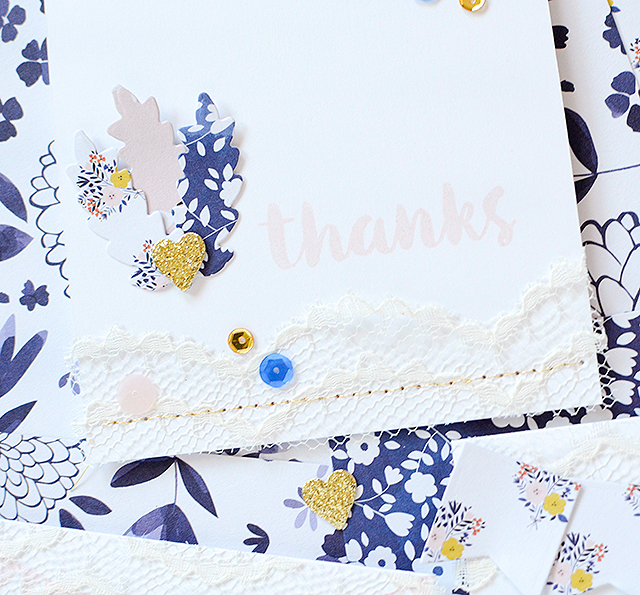 By the way, a MISTI or similar tool takes away the agony of stamping on a card directly--so worth it for us stampers! 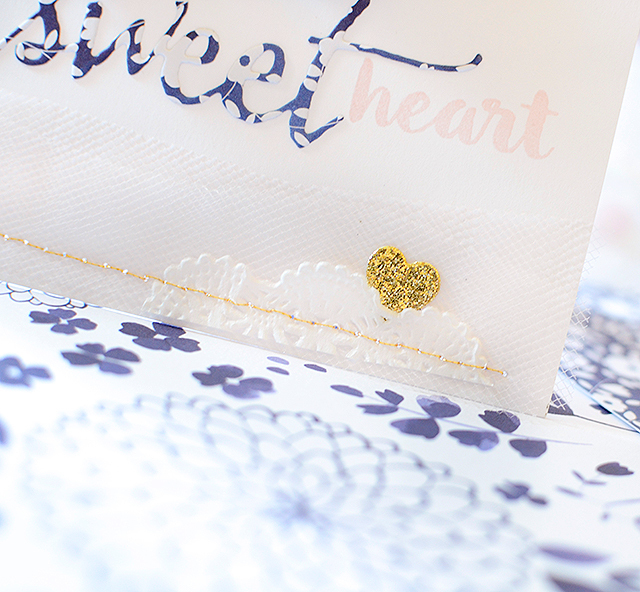 Anyway, the little stamped border under the lace on the last card is an incredible element I would never have thought of--love it! 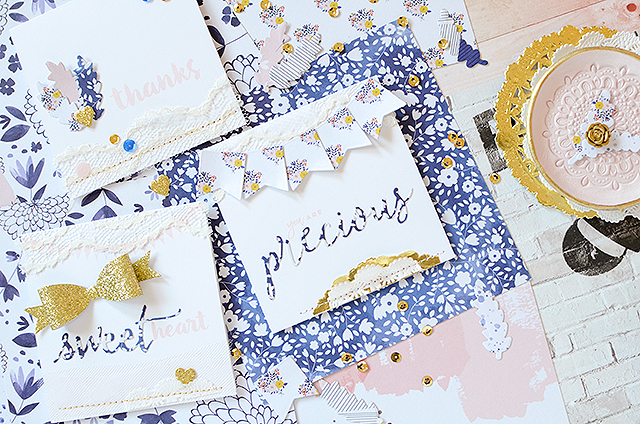 Thanks for all the inspiration & now I'm going to go use some dies with printed paper! These are beautiful, and W& W Cutaways are so inspiring to use! Beautiful cards! Love all the Cutaways you used! Great colors and patterns! Can't wait to see your next post! Your cards are beautiful even if you were short on time. What a beautiful project, with exquisite detailing. I love the blue, white and gold color combo, and that gold stitching on the lace. I'm looking forward to seeing the project you started on but didn't complete, because this "last-minute" one is awe-inspiring! Rebecca, these are all precious AND sweet. They really are lovely. I love the mix of colour tones and textures...and who can resist a bit of sparkle and shine. Gorgeous gorgeous cards all of them! Beautiful cards!!! Love all the details and the amazing colors!! !